Two runners a first year Interactive Arts student gave me yesterday. I remember my mom using this type of curtain runner..they made a great noise on the metal guide rail. More buttons...just by chance I seem to have a number of button related items. 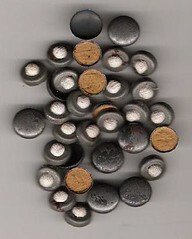 These metal buttons are covered in material. I think they were for undergarments? I expect they would survive going through a mangle. Two bachelor buttons (so named as a man can attach them as it doesn't involve sewing...and men as we all know can't sew!!) or so we are told. ARE YOUR BUTTONS WELL MADE ? Here are a few instructions to assist you with the covering. 1. They should be clean, strong and perfect. 2. Silk Buttons should never be made with single silk; always double and it necessary treble according to the thickness of the material used. 3. Only reliable and responsible workers should be entrusted with the making of the buttons if you wish to have good results. 4. VICTORY Covered Buttons can be made at the rate of a gross an hour at the very least. 5.Please get in touch with the Vendor of this box of the Moulds if you experience any difficulty with your Machine and Dies, or in making a perfect button. THE VENDOR WILL SEE YOU RIGHT. You can't go wrong with VICTORY Covered Button Trimming. 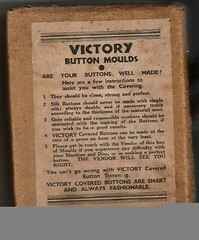 VICTORY COVERED BUTTONS ARE SMART AND ALWAYS FASHIONABLE. 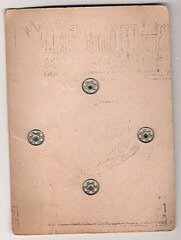 The box is full of these backs and fronts of buttons that have to be assembled and covered and stamped to hold them together. This card is some well printed and designed for just 4 poppers. Back view..the printing on the back isn't from the front..the card must have been placed on another wet card. My second pack of these....found on the wrdrobe sort out...its amazing what we find hidden in boxes. Another item found during our Xmas clear-out. 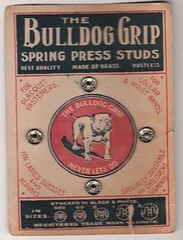 The back of the cufflink packet. 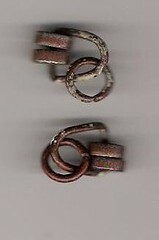 2.Slide Short prong under curl. 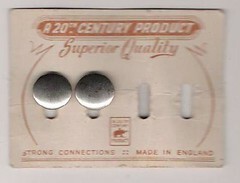 3.Press both ends to snap closed. THE ONLY PIN CURL YOU SLEEP ON IN COMFORT! No jabbing or protruding ends. Won't catch hair - won't tear nets, pillows or scarves. Usable with permanent wave lotions - won't stain hair, fingers. Cannot distort after continual use. Moisture is not locked in (Prongs so not oppose each other)....gives hair more air and breathing area. Hair is held securely to scalp - no discomfort or slipping out of place. One piece clip that stays open until set in place...makes hair setting a pleasure. 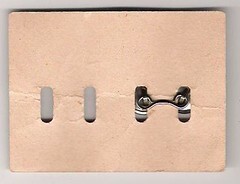 Use as a Barrette that dresses up your hair styling. A GOLDEN ROSE BEAUTY PRODUCT.